Height = 630mm- L to R = 1016mm- F to B = 730mm. The Cabinet is available in 5, 6, 7 & 8 drawer units for the 50mm depth and in 10, 12, 14 & 16 drawer units in the 25mm depth option. 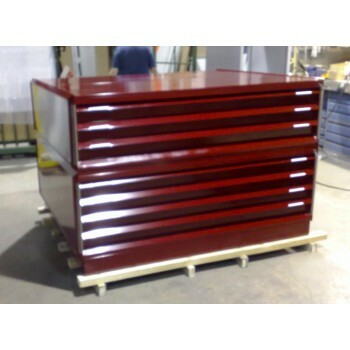 Units may be stacked to customer requirements. This all steel constructed cabinet is available in a range of sizes from A2 to AQ and is available in both 25mm or 50mm drawer depths. The drawer depths may be mixed.